Home | Penrhyndeudraeth Tourist Information and pictures of Penrhyndeudraeth, Gwynedd, Wales. The village sits on the banks of the Afon Dwyryd estuary, and within minutes (by car) of several of the best beaches in Wales. Just 25 minutes from the highest peak of the Snowdon mountain range, visitors can take a railway up to the mountain peak, where you can appreciate the breathtaking views of Snowdonia National Park from the comfort of the café. More daring visitors can however take the hike up the sheer sides of the mountain! There is also the splendid village of Portmeirion just a mere mile away along the A487, a quirky place mixing both Italian, baroque and Welsh architecture. As well as Portmeirion, there are plenty more attractions to visit: the Lloyd George Museum in nearby Llanystumdwy, dedicated to the late Prime Minister of Great Britain, the Rhiw Goch ski centre with toboggans, ski slope and shop, and the castles of Criccieth, Harlech and Caernarfon. 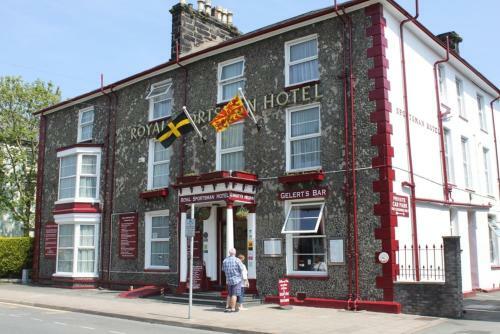 Accommodation isn't aplenty in Penrhyndeudraeth, but there are a number of self catering cottages, and hotels and guesthouses nearby, as well as accommodation in the neighbouring towns and villages. You may make an instant secure hotel or cottage reservation close to Penrhyndeudraeth. Hotel and cottage availability and letting rates are confirmed online prior to booking. Simply click through to the accommodation page, choose a suitable property, check availability, including dates of stay, to confirm the exact room rate and reserve the accommodation.